Tickle Ur Fancy edges out the rivals with Jockey Eduardo Sosa atop in The Portland Meadows Championship Bonus Challenge. PORTLAND, OR�OCTOBER 22, 2017�Bumped at the start, multiple stakes winner Tickle Ur Fancy recovered to defeat Sneakin Tr by half-a-length in the $23,535 Portland Meadows Championship Bonus Challenge Sunday at Portland Meadows. Perrys Getting Down finished a neck back for the show. Ridden by jockey Eduardo Gutierrez-Sosa, Tickle Ur Fancy completed the 440-yards over a "wet fast" racecourse in :22.344 seconds, a 92-speed index into a 10-mph headwind. Trainer Hector Magallanes saddled the Oklahoma-bred daughter of DOMINYUN for owners Hayden Brothers Ranch. The victory was the 10th in 18 starts for the brown filly who pocketed $11,768 for the effort. She has now earned over $74,000. 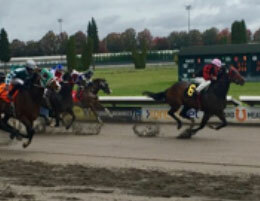 Tickle Ur Fancy won the Director's' Handicap at Portland Meadows on October 10. Bobby D. Cox bred the filly from the First Down Dash mare Sizzling Lola. Sneakin Tr pressed throughout under jockey Kassie Guglielmino but had to settle for a second-place payday worth $6,884. Scott Raley conditions the 6-year-old for owner Connie Chumbley. Bred in Oregon by Gary Chumbley, Sneakin Tr has earned $41,221. Adrian Gonzalez and Atilano Gonzalez' Perrys Getting Down earned $2,942 for third. The gelding hesitated at the start under jockey Jonathan Roman. Juan Romo, Jr. trains the California-bred 3-year-old. Perrys Getting Down was making his first career start outside California after finishing fifth in a PCQHRA Breeders' Derby trial on September 16. Bred by Vessels Stallion Farm LLC and Gianni Samaja, he has earned $17,029. Lebron 6, Shez Sneakin Fast, Sorelli, Rare Ed and Flyin Rocks completed the field.